Let's start off with this: I love Cuban food. Cuban food isn't anything like Mexican food or like Jamaican food or like ... well, it's not like a lot of foods you might think it's like. Cuban food doesn't use hot peppers, but you will find plenty of non-hot spices, along with citrus and garlic. It's really flavorful, but there's no burn. Don't look for chiles. As much as I do love spicy food, I also love non-spicy food. So, when I got a copy of Chef Ronaldo's Sabores de Cuba , I figured it would be a good book for me. 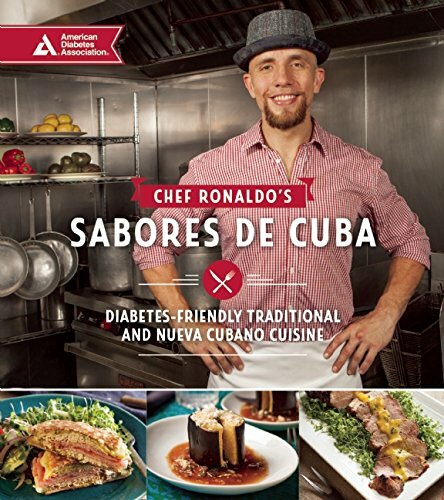 I didn't even notice that it was a book put out by the American Diabetes Association. But that's fine, too. I have a few of their books, and the recipes are good. There's not a lot of sugar, obviously, but when it comes to Cuban food, I'm mostly interested in the savory foods than the sweet ones. I bookmarked a couple of recipes, and had it narrowed it down to just a few. One was black beans and rice. I'm still planning on making that. But meantime, I decided to make a vegetable recipe. I chose Cubano roasted broccoli florets, but used cauliflower instead. because I love cauliflower and I happened to have one waiting to be used. It needed to cook longer than the recipe stated, but I think that's because cauliflower is more dense than broccoli. Or maybe I just wanted it more cooked. I think this would also be really good with Brussels sprouts. This is the sort of recipe where a little more or less of the vegetables (or a lot more or less) isn't really going to make a lot of difference. Just add more spice, if you need it, and it's all good. Preheat the oven to 350 degrees and line a baking sheet with parchment paper or aluminum foil for easier cleanup. In a medium bowl, combine the garlic, cumin, lime juice, pepper, and onion. stir or toss to combine. Add the oil and broccoli (or cauliflower) and toss again to combine. Place the cauliflower (or broccoli) on the prepared baking sheet. (Sprinkle with salt, if desired. The book didn't suggest adding any, but I think it was needed.) Bake until done to your liking. The time it takes depends on how done you like your vegetables. The book suggests 25 minutes for broccoli. I cooked the cauliflower for 1 hour because I wanted some browning. After tasting the cauliflower, it seemed that the lime flavor was totally gone, so I drizzled a little more lime juice on after it came out of the oven, and gave it another little toss. Serve warm. This is also good room temperature or cold in a salad.